The Old Iron Spring, Ballston Spa, NY. 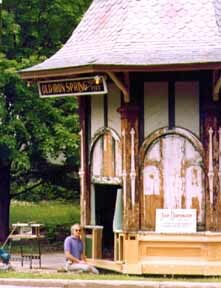 The Village of Ballston Spa, NY, is very proud of its Old Iron Spring. George Washington partook of its healing waters. Smelling the water doesn't inspire you to taste it, but Joe believed if it was good enough for the Father of His Country, he'd drink it, too. 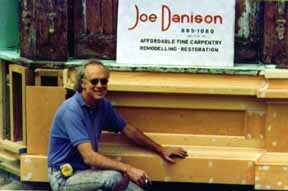 It didn't restore Joe's hair, but he believes it sharpened his mind so that he could execute an exact architectural reconstruction of the fine 19th Century craftsmanship that went into the building of the ornate kiosk at the site of the spring. In the summer you can buy hot dogs there...and bottled water.